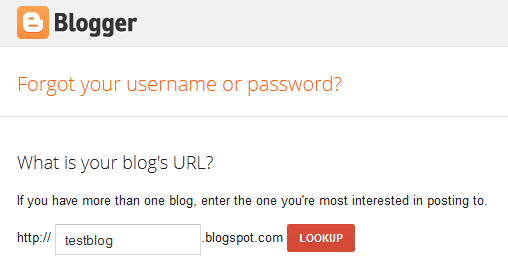 Enter the URL of the blog you're trying to gain access to. 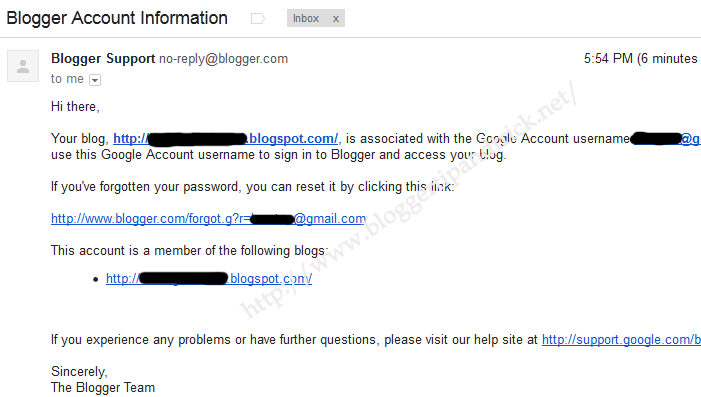 Blogger will send an email with sign-in instructions to that email address. This is really useful tip, I didn't know about this with url. Thanks , for the great post . This is BS. If i have forgotton the email which i need to sue to sign into blogger.. even if i put the info of the blog there.. how will i get that email when i dont know where to login...Tarts!!! I can't found my email address. "We've sent you an email message with login instructions for your blog at http://__________.blogspot.com/ . Email was sent to your yahoo.com account. If the email from this page doesn't seem to arrive, you should check your Spam folder in case the message was misrouted. Please make sure that your INBOX is not full so that this message does not bounce. If the email still doesn't arrive within 30 minutes, or if you experience any other issues signing in, please visit our password assistance page ." What is your opinion. Please help me! this is super BS! if you can't remember the email address that they are going to send the information to, how can you get the email? #stoppy, same situation. what i did, i browse back my blog, luckily, i had added the gadget " VIEW MY PROFILE" on my that blog , i clicked on that, and then it showed me my Blogger Profile, on the left side of the Blogger Profile it says: Contact me via Email or via Website. I clicked on Email, and then my MS Outlook popped up with the email address associated to my blog. so from their, i remember that this was the email i used for that blog. this can help you if you have that "View My Profle" widget on your blogspot. This is the most stupid feature of Google I have ever encountered with. The thing is how we gonna login if the email or username is forgotten at the first place and the big G says "the information is sent to the ....... email address". However, I had this problem before, but now I was recently able to recall my username. For the most part, my password is same. Tips for u guys, list out any possible username that u may think of that u had likely used to login for the blogger account. I think there is no other way beside this unless if u had used your phone number or alternative email address.